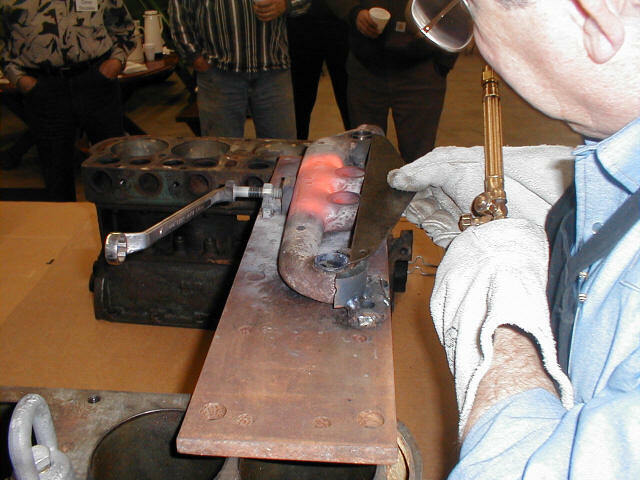 The September meeting was held at Jack Putnam's shop in Bluffton. Bob Torbet led the short meeting with 13 members and friends in attendance. The treasurers report was read and approved. Bob Torbet and Bill Mack are planning the upcoming tour to Kelly's Island. They have opened the tour up to anyone interested. We'd like to have a one day tour on a Sunday in October. It will likely be centered out of Lima. The price of the Newsletter was discussed and some members agreed to have their names taken of the mail list. This will help drop the cost a little. It was decided to continue to put everything as usual on the internet; but, for the present make the hard copies in black and white. We have a copule of people in the area looking for a Model T to buy. If anyone knows of a homeless T that could be adopted, bring the name and location to the next meeting. Price will of course be determined by mechanical and cosmetic condition. People that are just starting into the hobby really need a drivable car to get started. After the meeting everyone enjoyed a time of fellowship and discovery. The current car in the shop is a 1915 roadster that with a little investigation is really a 1916. The car has been 15ized by addin g the brass rims on the head and side lamps. It is rumored that there are more classic 1915's today than were ever produced by Ford. The classic 1915 look only existed from February through July of 1915. While, the similar 1916 was made from August 1915 to August 1916. Yet there are very few 1916's out there. 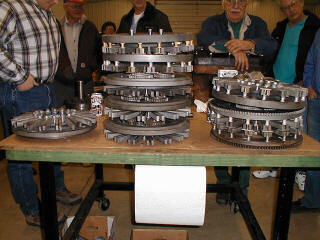 Coils were tested, cookies were eaten, and Model T topics were discussed. All in all, a good time was had by everyone. A few of the guys will be going to Hershey this year. If you have never been there yourself, you should. It is an old car paradise. Acres and acres of rust, brass, nickel, and chrome just prime for the picking. If it exists, you'll find it at Hershey. There is always a swap meet for the newer cars in Carlisle, PA the week before; so, all of the hot rod stuffis out of the way. The AACA puts on one great swap meet that caters to our tastes in automobiles. If anyone is looking for a particular item, but will not be able to go this year, let Bill S. know. he has said that he will keep his eye out for any item that he knows someone needs. He'll probably even accept cash advances if you offer. Please keep items small or supply the trailer to haul something back. 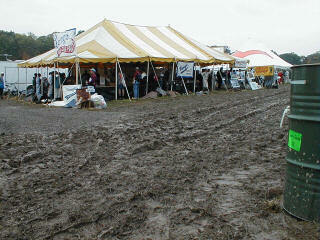 This is a picture of Lang's Old Car Parts in the Yellow field on one of the more sloshy years. Touring season is almost over and it is time to be thinking about those winter projects. With all of the experience in this club, we should be able to get everyone ready for next summer. There isn't any reason for a Model T to be sitting in a garage idle. Bring your ideas for winter projects to the October Meeting and we will try to work out a schedule of tech meetings to cover all aspects of Model T repair. This club has been a great asset to the Model T community in the past. Our web site is visited by over 100 people every month to see what we have been up to. Here is an opportunity to help other Model T enthusiasts like yourselves and get a car up and running at the same time. We do need to become a little more organized about our technical articles. I generally either work on the project or take the pictures. The organization that we need is someone taking pictures, someone writing the description of what's going on, and a group of mechanics to do the work. 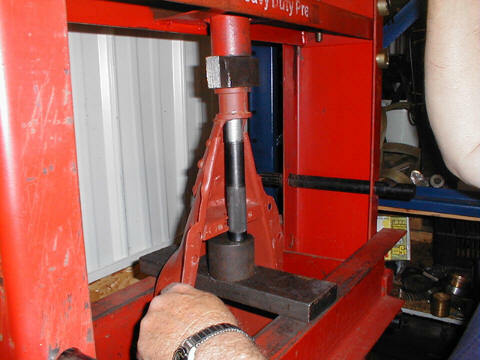 Bearings are pressed into a new old stock engine pan. The island tour was a great success. Here are a few of the pictures of the cars on the way to and from Kelly's Island. Bob did a great job of organizing a "do what you want" tour. Less structure is better. We did all meet on Kelly's Island for dinner and most of us flew in the 1938 Waco; but, the rest of the time we were on our own or with our little groups. 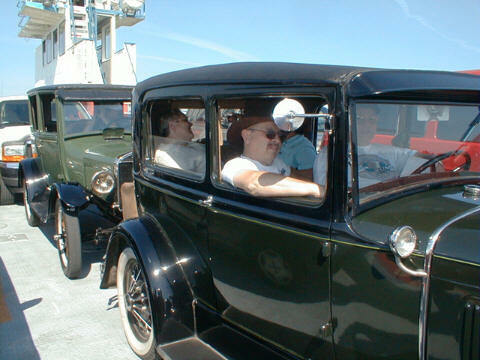 Richard and Rita Baker driving along the lakeshore in their Model A sedan. 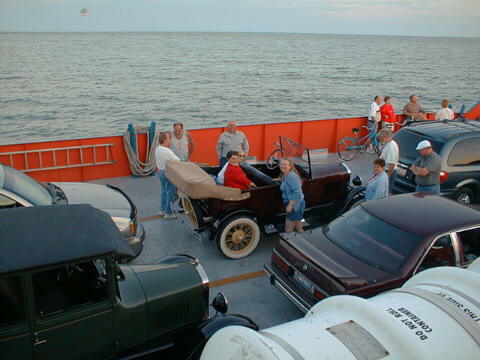 The girls of the club were busy discussing the finer points of model T restoration on the ferry as it crossed Lake Erie. That's the proud owner standing besided his treasure as others inspect his handy work. 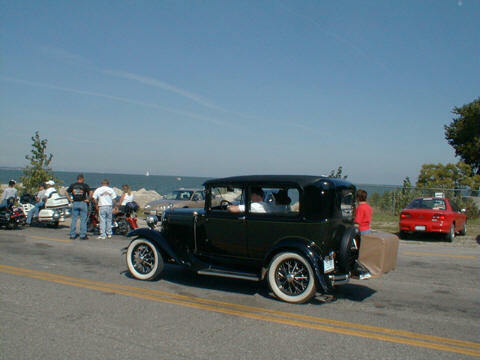 This Mode A Coupe and Model T C Cab are owned by a gentleman form the Columbus area. He also is the owner of the aircraft in the next section below. That's Kelly's Island in the background. 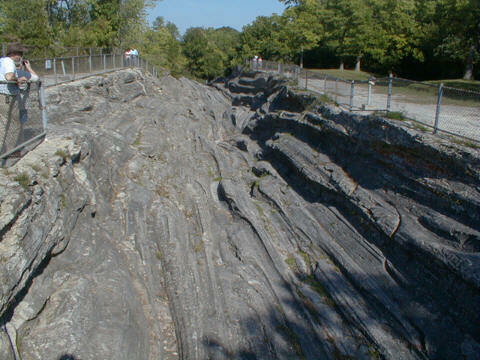 The Glacier Grooves are seen here from the top. These grooves were discovered while the Island was in the process of being hauled away as limestone for the greater Cleveland area during the early years of the island's history. 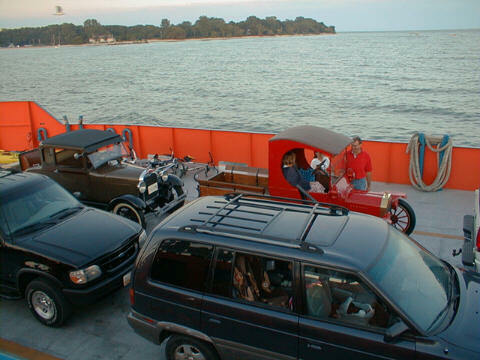 The Bakers and Fishers from the Tickin' T's of Central Ohio enjoy a leasurely drive across Lake Erie on the way to Kelly's Island. That's Dave Noltings 26 Tudor following just a little too close for comfort. 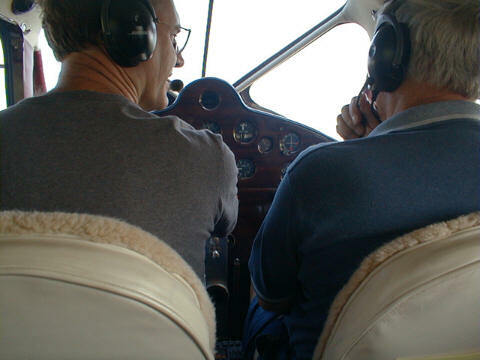 This is a shot of Bob Torbet talking to the pilot just before Bob took over the controls. The controls just pivoted from one seat to the other. 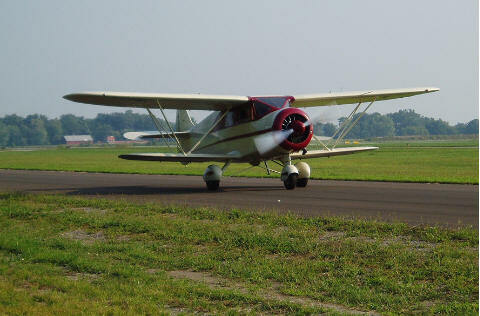 The Waco was made in Troy, Ohio. This model was the smaller of the two models made in 1938. 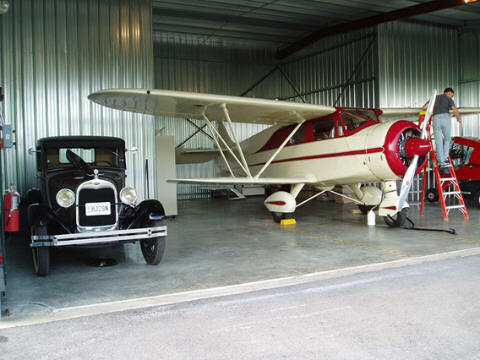 It features a 7 cylinder rotary engine, double wing flaps, and a leather interior. 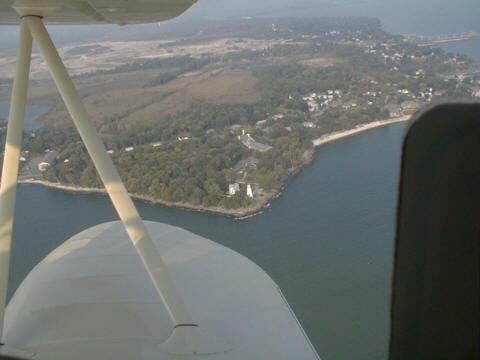 This shot of the Marblehead Peninsula shows just how much of the area has been mined away. We also got to see how much of Kelly's was missing from the same limestone mining. We would like to tour again before winter. Please make your suggestions at the next meeting. Anyone can plane one of these things. Just ask Bob.